The liner tubes below are made to fit Loki Research motors first and foremost but will also fit most all other snap ring "Research" hardware with the exceptions below. 38mm liners will not fit Kosdon, Ellis Mountain, AWM or Gorilla hardware. 54mm liners will fit any commercial 54mm snap ring motor hardware except for Ellis Mountain. 76mm liners will fit ANY 75mm or 76mm commercial snap ring motor hardware. They will also fit the ID of Aerotech and CTI 75mm hardware, but not that of their other internal components. 98mm liners will only fit Loki Research style 98mm hardware with an ID of 3.50", not 3.485" or 3.490", but 3.50". They will fit "early" AMW hardware, but not later model AMW or Gorilla 98mm hardware. Please be aware that if your .hardware is made from extruded, or standard drawn tubing and is out of round, or has low standard dimensional tolerances you may have fit issues. This is a very uncommon occurrence but it does happen from time to time. LE & X grade convolute liners have a much higher phenolic resin content than spiral kraft/phenolic paper liners. They are NOT equal products. LE & X convolute liners provide far superior thermal protection over any kraft/phenolic spiral liners of equal wall thickness. LE & X grade Convolute liners are recommended for use in any motor where higher chamber pressures &/or temperatures are desired or expected. They are also an inexpensive insurance for your motor hardware, protecting against case blistering or burn thru, or for when testing/developing new and unproven designs. The lack of any spirals with a tight fitting casting tube means there are no pathways for hot gas to travel along the outside of the casting tube, potentially burning it away to the propellant at high chamber pressures. All convolute liners come with stiff, high quality, custom fit casting tubes. 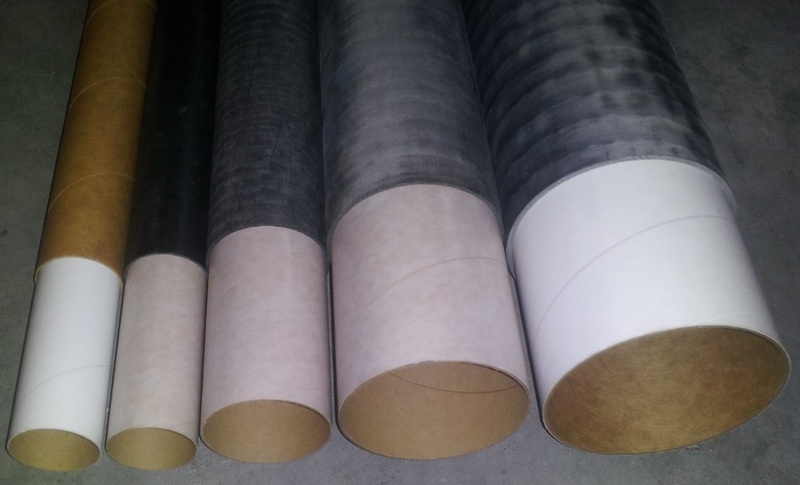 X grade liners are recommended for use where the highest thermal insulation demands are required. LE grades are sufficient for lower temperature, lower metals propellant formulations and/or shorter burn times. 38mm Convolute Wound LE Phenolic Liner and Casting Tube Set. Casting tube ID is 1.212". 38mm Convolute Wound X Grade Phenolic Liner and Casting Tube Set. Casting tube ID is 1.212". 54mm Convolute Wound LE Phenolic Liner and Kraft Paper Casting Tube Set. Casting tube ID is 1.755". 54mm Convolute Wound X Paper Phenolilc Liner Tube with kraft paper casting tube. Casting tube ID is 1.755". 76mm Convolute Wound LE Phenolilc Liner and Kraft paper Casting Tube. Casting tube ID is 2.551". 76mm Convolute Wound X Phenolilc Liner and Kraft paper Casting Tube. Casting tube ID is 2.551". 98mm Convolute Wound LE Phenolilc Liner and Kraft paper Casting Tube. Casting tube ID is 3.225". 98mm Convolute Wound X grade Phenolilc Liner and Kraft paper Casting Tube. Casting tube ID is 3.225". 98mm AMW Convolute Wound LE grade Phenolilc Liner and Kraft paper Casting Tube. Casting tube ID is 3.225". 38mm Casting tube cap. Reuseable. Smoke grain for 54mm standard bulkhead with o-ring. One grain fits the standard 54mm bulkhead. Can be shipped USPS surface mail without HazMat fees. 1-2 week delivery time is typical. Includes 5 delay elements and 30 o-rings to fit Loki 38mm bulkheads. Can be shipped USPS surface mail without HazMat fees. 1-2 week delivery is typical. Smoke/Delay Elements - faster burning delay, 38mm 5-pack. 1-2 week delivery is typical. Includes 5 delay elements and 30 o-rings to fit Loki 38mm bulkheads. These are off spec delays which are .765" to .785" long. Can be shipped USPS surface mail without HazMat fees. O-Ring (-120) for 54mm bulkhead smoke well.